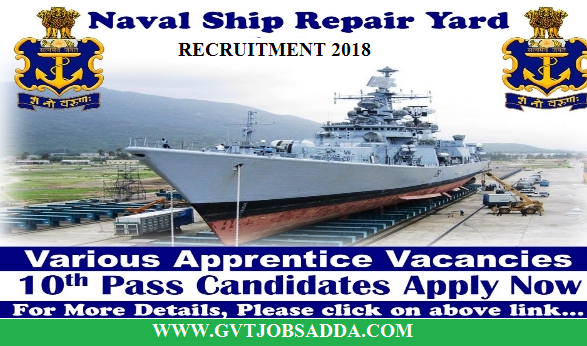 Naval ship repair yard karwar karnataka has Applications are invited from ITI qualified Indian citizen (both male / female) in the various designated trades for enrollment into apprenticeship training at Dockyard Apprentices School, NSRY, Karwar under Apprentices Act, 1961 read in conjunction with Apprenticeship Rules, 1992. A total of 150 vacancies. LAST DATE TO APPLY ONLINE : within 30 days from the date of publication of this advertisement in Employment News. AGE LIMIT : Candidates should have completed 14 years and below 21 years of age as on 01 Apr 2019 i.e. born between 01 Apr 1998 and 31 Mar 2005 (both dates inclusive). EDUCATION QUALIFICATION : Candidates scored above 50% marks in Matriculation or equivalent and above 65% marks in the relevant ITI trade recognized by National / State Council for Vocational Training (NCVT / SCVT). Minimum education qualification for candidates who are to be enrolled for Rigger as ‘Fresher’ shall be 8th Std pass (desirable ITI (Fitter)). HOW TO APPLY : Eligible candidates should forward an application in the prescribed proforma (Annexure – 1) alongwith the under mentioned documents by speed / registered post to “The Officer-in-Charge, Dockyard Apprentice School, Naval Ship Repair Yard, Naval Base, Karwar, Karnataka – 581 308” within 30 days from the date of publication of this advertisement in Employment News.